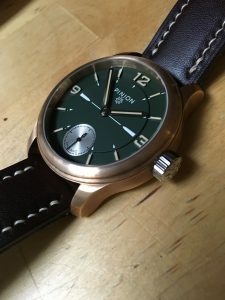 I have been waiting for what seems like for ever for the latest watch from Pinion, the entry level Atom, to become available. You might remember I first saw this watch at the Watchmakers Club event before last year’s Salon QP. I was looking forward to getting my hands on one for a review. 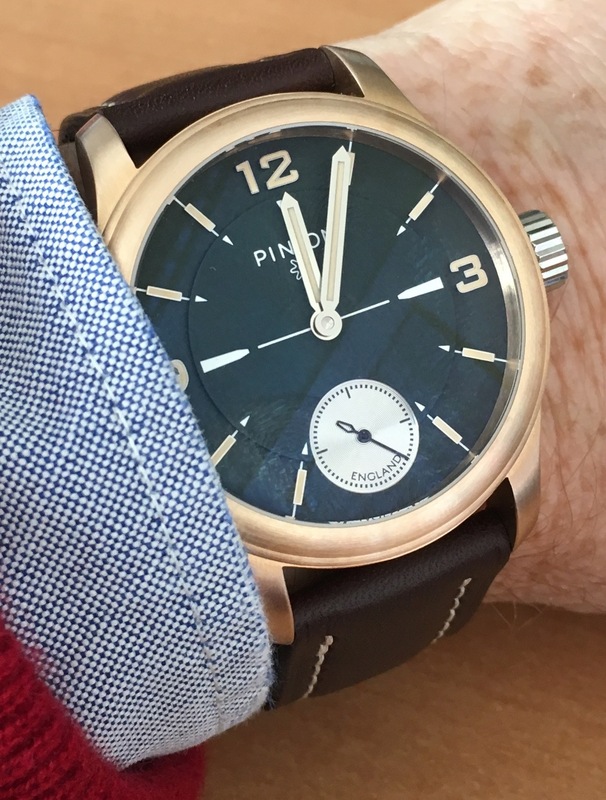 Then last week an e-mail arrives from Pinion announcing there were only 20 watches left and once these were gone that was it, or at least until Piers Berry, the founder, changes his mind. So that was it, no watch for me to review. Salon QP, a more significant watch magazine than my blog, did however manage to get hold of one for review. So I thought I would flag this up to any of you that might not have seen it. So here is a link to to their review. Hopefully, I will get a chance at the future new watches Mr Berry is hinting at. This is a rare opportunity to post about two things that occupy the most of my online attention. 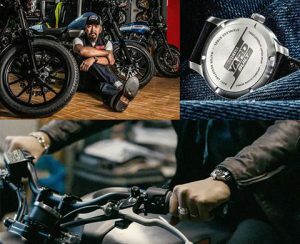 Watches and motorbikes, I am also quiet interested in Japanese denim but that’s for another time. During the last Apex evening Piers Berry did mention there was a “Pinion Motorcycle ” in arrival. In collaboration with Yamaha Europe, they are working on a customised XSR700. Shun Miyazawa is the Product Manager at Yamaha Europe and the man behind ‘Yamaha Yard Built’ motorcycles. 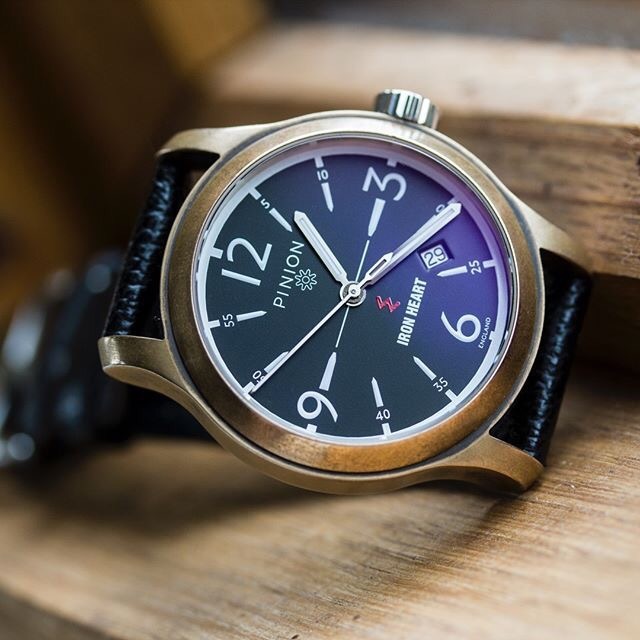 Shun wears the Pinion X Iron Heart Watch 01 – And last year we were delighted to produce a very limited run of these watches with a special ‘Yard Built’ engraved case back. I am really looking forward to see what the result looks like. In the absence of any news over the last few days I thought you might like to see this Pinion one-off made for their collaboration with Iron Heart Denim the Japanese jeans manufacturer. The picture comes from Pinion Instagram . Hopefully the much awaited “news” from Pinion will be announced at one of these events. I have just received an e-mail informing me that you can now buy the splendid looking Pinion Revival 1969 from their website. I hope to see this watch for myself this evening. I will let you know. 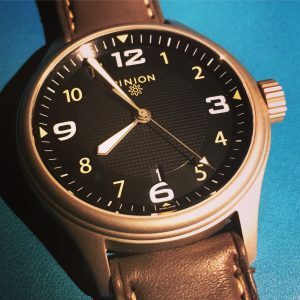 ISince launching in 2013, British watch company Pinion has blossomed as a street-smart modern brand that wears its traditional influences lightly. Founder Piers Berry tells QP how he’s built a brand from nothing. It is a cold fact that only a minority of new watch brands succeed. And much as it’s satisfying to have witnessed several making their world debut SalonQP over the years, it’s even better to see them return stronger subsequently. Oxfordshire-based Pinion has done just that. Having launched at 2013’s Salon with the warmly-received Axis Automatic – a watch whose sleek, military-tinged looks reflected the design pedigree of its creator, Piers Berry – Pinion was back last November with a new chronograph, the Revival 1969 (below). 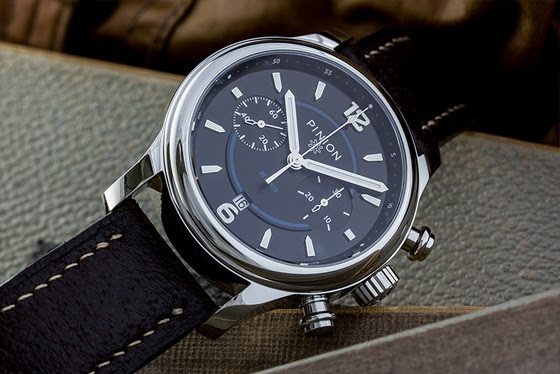 Pinion has also recently been taken on by San Diego specialist in independent watches, Passion Fine Jewelry, where it will sit alongside the likes of Habring, Speake-Marin and Lang & Heyne. According to Berry, further retail developments are in the offing. It’s not bad for a company whose founder, prior to launching, had no experience of the watch industry. On paper at least, it would look like Pinion was born in a storm. Three years ago, with Britain still mired in recession, who would have put money on a digital designer of 20 years’ standing leaving the world of pixels, apps and wireframes – just as the first generation of smart watches emerged, no less – to found a watch brand rooted steadfastly in past traditions? After a few years, he had bought his own Panerais, and started to make contacts in the industry which would later prove valuable. Nevertheless, he was finding himself increasingly dissatisfied with the watches he encountered, and gradually started forming a plan to do something about it. After making contact with potential Swiss movement suppliers, dial specialists and case makers, Berry began to see that his dream could become a reality after all. In 2013 Pinion watches was born, launching its debut collection, the Axis, at SalonQP – with, as Berry had hoped, a bronze-cased watch at its core. This model, notable particularly for its green dial iteration, became the lynchpin of Pinion’s fledgling collection. For Berry, however, getting even this far had been a rollercoaster ride in itself. “When the brand launched at SalonQP, I didn’t actually have any watches until two days before the event. Six weeks before, we didn’t think there were going to be any watches at all. I had to start again from scratch quite late on,” he says. A lack of physical product in fact resulted in an extra watch being added to the collection at the last minute. “The only reason I launched a DLC version is that it was the only watch I could mimic accurately enough in Photoshop to show online how it was going to look,” Berry admits. Inevitably the watch, the Axis Black (below), sold out. Immediate interest in the Axis suggested Pinion was clearing one of the toughest hurdles facing any new brand, which is to prove it has a viable idea in the first place. Next Berry needed to show he could keep developing the idea. First came a limited-edition collaboration, the Axis Iron Heart, produced with a high-end Japanese denim manufacturer. Next was the Axis Pure, also limited in number, which played to retro tastes by replacing the ETA 2824-2 movement of the Axis Automatic with a hand-wound Unitas 6498, and adding a small seconds subdial and applied markers. This is available in both steel and bronze iterations. Key to that was finding the right movement, and top of Berry’s wish list was a manual caliber that would increase the sense of functional, tactile engagement with the watch. Manual chronograph calibers, however, are not produced for supply these days, and Berry had resigned himself to designing the R1969 to suit the tri-compax layout of the perennial Valjoux 7750 movement. However, Berry has been able to source a batch of unopened ebauches – unassembled blank movement kits – for another historic Valjoux movement, the 7734. The ebauches were made in 1969 but never assembled, and had remained packaged up in their boxes, as new, for 45 years. The 7734 was used by a number of brands in the 1960s and ‘70s, including Breitling, Heuer and Tudor, and was seen as a rugged and reliable workhorse. Today, with handwound chronographs (aside from Omega’s Moonwatch) pretty much the preserve of the haute horlogerie sector, the open case-back affords a pleasing look back into history; while one of the movement’s most recognizable features, the v-shaped chronograph bridge, has been customized with an engraving of the Pinion logo. The dial is, as promised, free of calculating scales, but on close inspection is full of finely-nuanced details. The subdials, the hour markers, the outer minute track and the raised centre section are all cut to different heights and given different finishes. The Revival 1969 is being created in a limited run of 100 pieces (there being 100 movements), priced at £4,950. A heady price, perhaps, but then it’s an unusual watch created with a deeply independent spirit, as Berry points out. One thing about which Berry is more circumspect is the notion of Britishness within what he does. It’s a fact that while movements are assembled on these shores and Berry uses British-made straps, the rest comes from Switzerland, and that’s unlikely to change in the near future. While he proudly inscribes “England” on the dial of his watches, the much-vaunted “revival” in British watchmaking – overhyped, undercooked – is something from which he distances himself. 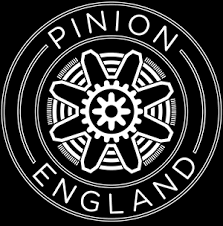 For more information on Pinion’s gatherings, which take place at Century Private Members Club on Shaftesbury Avenue, have a look here.